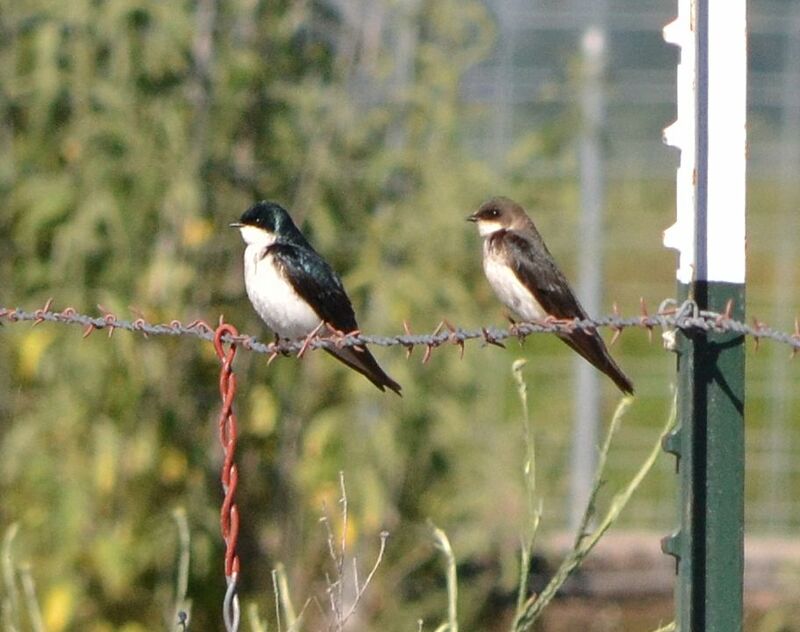 I debated about whether these tree swallows (Tachycineta bicolor) were a male and juvenile or an adult male and female. I finally decided on a male and female, but welcome other opinions. My reasoning was that the juvenile tree swallow is completely brown above while the female, although often brown on top, shows some of the typical blue-green iridescence of the male. Close inspection does reveal some blue-green on the back. The juvenile tree swallow also has a yellow gape at the base of the bill, which I cannot see in any pictures of this pair. Although there seemed to be more tree swallows than usual in our area this past summer, these long-distance migrators have already left for their winter homes along southern coastal areas and Central America. These tree swallows were photographed along the Tule River in Shasta County CA. This entry was posted in Birds and tagged nature photography, Tachycineta bicolor, tree swallow. Bookmark the permalink. Good descriptive reasoning and they are comparable in overall length size. Aren’t they a tough species. We see the first of the European swallows arriving here in the Cape – earlier than usual – a shift in climate patterns? Thank you! Tree swallows are the first to arrive here in the spring – well before the other swallows.